You can prompt to scan a barcode on the DL-AXIST device using the SoftSpot application or buttons on the device. Softspot is a user-definable ‘floating soft trigger’ that can be located at the most comfortable position anywhere on the large touch display. To setup SoftSpot, click here. 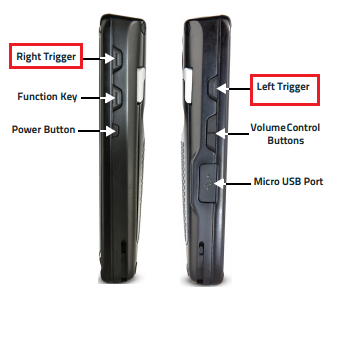 Use the left or right trigger buttons on the sides of the scanner to prompt the scanner to scan. These buttons are found on the top of the scanner on either side of the device. You can also press the scan key found at the bottom of the display on the device.